Advice: Closed Monday and Tuesday. With it’s focus on creamy ice cream, owners Michael Wong and Tinn Chan have already achieved this accolade. 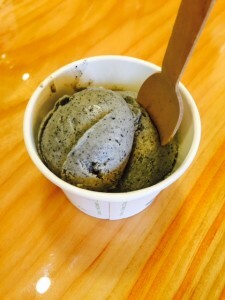 Their beautiful new ice cream scoop shop on the West side has already won me over with some of the best Black Sesame ice cream around. Rustic wooden countertops and a communal table for sharing along with an open kitchen allows for a sneak peak to watch the ice cream being made. 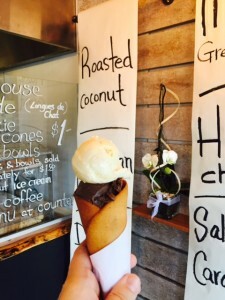 The ice cream is all home-made, it’s rich using top quality ingredients, I like that the flavours aren’t too sweet; they also make unique handmade cookie cones which are made from a French cookie called Langue de Chat. 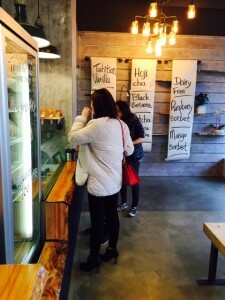 As I have visited a couple of times, I have had the Black Sesame ice cream in a bowl; as well as their Roasted Coconut on top and Chocolate on the bottom on their house made thin rolled langues de chat cookie cone. 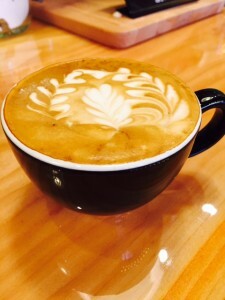 In addition to their fondness of ice cream they are also purists when it comes to coffee, having learned the art of coffee roasting, I have enjoyed a Cappuccino as well made with their own beans. A regular scoop is $5, doubles at $7, add a $1 for one of their cookie cones, or pickup a pint for $11. 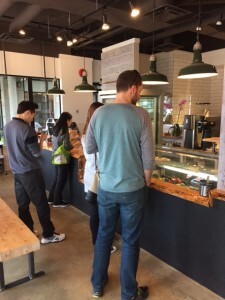 This is a scoop shop that is worth standing in line for.